Malva is a fabulous family home in a generous elevated plot, offering spacious family accommodation together with an annexe which is perfect for dual family use for a dependent relative or can be let as income. 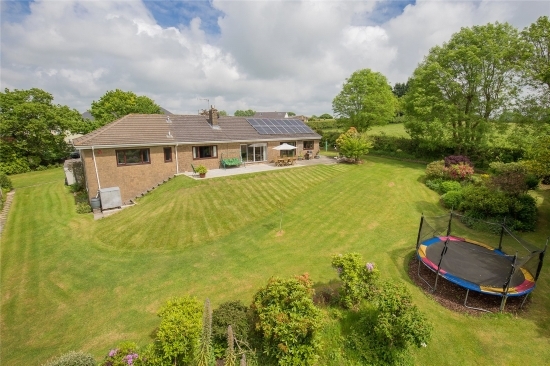 Located on the edge of the bustling south Dartmoor village of South Brent, Malva enjoys spectacular views of Ugborough Beacon and the open moorland of the Dartmoor National Park. The current owners have made a number of improvements to the property but there is still potential for a new owner to make their own mark. From a central hallway, the accommodation mostly sits on the southwest elevation taking in the best of the views with open plan kitchen/diner, sitting room, 5 bedrooms (including master bedroom with en-suite), family bathroom, cloakroom and utility. The annexe has a separate entrance offering its own kitchen, sitting room, conservatory with established vine, bathroom, bedroom and dressing room. The large outdoor patio, accessed via both the sitting room and kitchen, enjoys all day sunshine and stunning views, the remaining gardens are mostly laid to lawn with mature shrub borders, Devon banks and mature hedge boundaries offering a good level of privacy. To the front is a very generous driveway leading to the double garage. South Brent which offers an excellent range of shopping facilities, including supermarket, butchers, delicatessen, also offers a health centre, dentist and community centre. The village has both nursery and primary schools with senior schools in nearby Totnes, Kingsbridge or Ashburton. A regular bus service connects South Brent to Plymouth, Totnes and Exeter.